It’s fall! 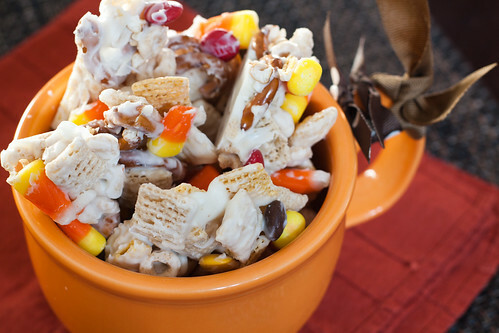 Time to break out the candy corn. I love candy corn. It makes me happy. I had some ladies over the other night to work on some of our pinterest projects. It was such a fun night with everyone working on their own projects. We all had a fun time and I got two projects done. Yay me! I had set out some traditional snacks for the night like chips and dips, veggies and hummus, but I like to include some sweet treats too. I had made the Pumpkin Pie Pudding Cookies and this Candy Corn Crunch. Everyone loved both of them. I have said it before but it needs repeating. If you are having someone over they will go crazy for carbs covered in chocolate. I’m serious. Make this next time and watch what happens. Aside from the fact that people love it, it is so easy to make and is a great no-bake option. If you don’t have almond bark you can use white chocolate chips or Wilton white candy melts. They all work the same. Line a large sheet pan with parchment paper. Pour the rice and corn Chex, the pretzel pieces, and the Cheerios into the middle of the pan and mix together. Spread in and even layer making sure to keep them close together. You will not use the entire sheet pan, I just like to have plenty of room so things don’t fall off when mixing. Melt chocolate in microwave or over a double boiler until just melted. Pour melted chocolate over the dry ingredients. Use a wooden spoon to move things around a bit to make sure chocolate is holding all the pieces together. Sprinkle top with the M&M’s and candy corn. Mix gently with spoon to make sure each candy is sticking to the mixture. Break into chunks for guests to enjoy.